I personally have yet to sign up for Amazon Prime--mainly because I keep forgetting!! I don't buy too much online but if I do you know I will be joining this as well. When I do order on-line I always want to know that the item will get to me quickly--with Prime you get 2 day shipping--LOVE it. 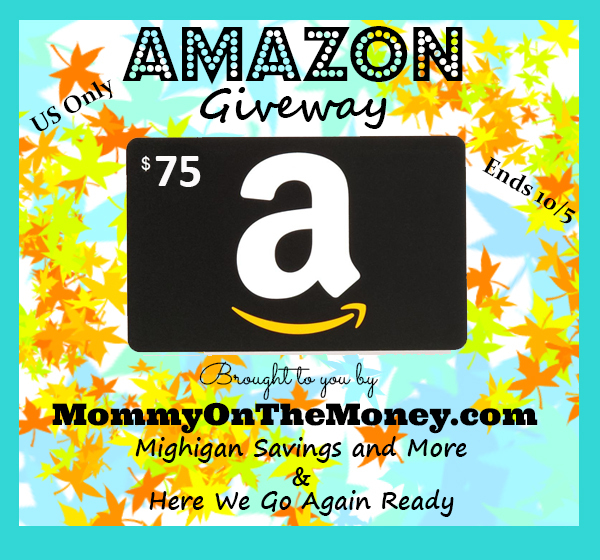 Plus Amazon has almost everything anyone could want---------so check it out after you fill out the giveaway form so that you might be the lucky winner of the $75 Amazon GC!! I received entries on the giveaway form for posting this giveaway. All opinions expressed are my own honest opinions. For more information please check my Disclosure Statement. Our giveaways are in no way sponsored or promoted by Facebook. I think I would buy some new sweaters for fall,I haven't gotten anything new in a long time and Amazon.com has everything! I would buy gifts for my family! I would love to win so that I could buy Legos for grandson who really loves them! I want to win to put this towards Christmas shopping. I want to win for Christmas. I would put it toward birthday and Christmas gifts! It is my three sons who have the Lego obsession! They all love building new things! I'm not into Lego, the guys are. May get xmas gifts. 1st off to buy Yule gifts for the vets at the Temple, Texas VA hospital, and 2nd my in laws are from Denmark where LEGO was first developed, and we have over a hundred different box sets from when my husband and son were little boys, some of these sets date back to the very beginning, they are still in their original boxes. I enjoy Legos myself. I had more fun playing with them than I did dolls as a kid. I would put the gift card towards Christmas gifts for the family. I would use this gift card to do some on-line Christmas shopping this year. I would save this for Christmas gifts. I would put a subscription to audible.com. i want to books from my wishlist. I would buy things needed for my kids Halloween costumes! I would use it towards getting gifts for Christmas. I'll save it for Christmas! I am currently remodeling my whole house, so it would help buy something involved in the renovation.